Thatch harbors insects and diseases. Thatch can restrict grass roots from growing into the soil root zone, resulting in a shallow rooted lawn. Thatch interferes with water infiltration aeration aids. Remove excess thatch by vertical mowing or core aerating. 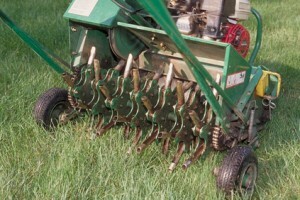 Core aeration using a hollow steel tine core aerator, which removes cores of soil. This physically breaks up the thatch, brings up beneficial soil micro-organisms that help break down the thatch and alleviates compaction. Over seeding is a method of thickening up a lawn that has become thin or damaged by insects, diseases, weeds, drought, excessive traffic or other types of damage. To ensure success, add compost, peat or top-soil before overseeding. Overseed at double the seeding rate for establishing a new lawn. The best time to overseed a lawn is in the fall (mid-August to mid-September). Keep the overseeded area moist by watering several times a day. One week after seeding, reduce watering to twice a day until seedlings are established. 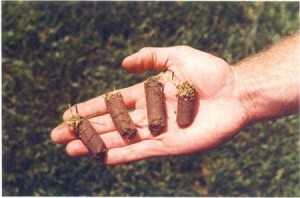 Sodding is another method of re-pairing damaged lawns. Cut out dead or damaged areas to a depth of roughly 4 cm. Rake the soil, add fertilizer and place the sod on top of the soil. Insure good sod/soil contact by stepping on the sod or rolling it. For the best results, sod should be watered within an hour of being laid. Water sod frequently and make sure it does not dry out until it is fully rooted. Newly sodded areas will be rooted in 10 days to 2 weeks. See the OMAFRA Factsheets, Lawn Establishment, Order No. 08-025w, and Lawn Renovation, Order No. 08-021w, for more information on overseeding and sodding and for a summary of the timing for fertilization, mowing, irrigation, overseeding and aeration.